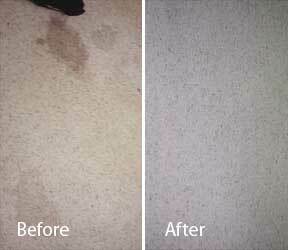 Getting old cat / dried cat urine, dog urine or human urine stains and odors out of carpets, rugs, upholstery, etc, is a tough undertaking. 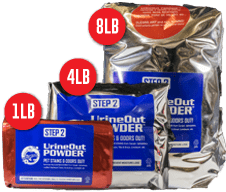 Use our helpful tips and proven products, like UrineOut Powder™ microscopic sized cleaning “sponges”, to get the job done. How does UrineOut Powder™ microscopic sized cleaning “sponges” work with the vacuum? 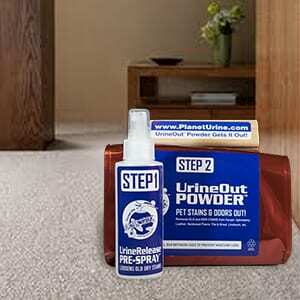 Planet Urine’s UrineOut Powder™ WORKS! It’s microscopic sized cleaning “sponges” are filled with a special cat urine, dog urine and human urine stain and odor removal solution. You simply work the UrineOut Powder™ microscopic sized cleaning “sponges” into your carpets, rugs, mattresses, upholstery and even hardwood floors, tile and concrete. You let the worked-in Powder stand while it “sponges up” cat urine, dog urine or human urine stains and odors. Wait overnight. Then, you simply vacuum the Powder out. It’s that simple! 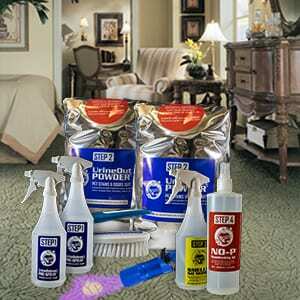 CAT URINE, DOG URINE or HUMAN URINE STAINS & ODORS ARE GONE!!! Adding Liquid to Dog Urine, Cat Urine or Human Urine Stains Only Dilutes and Spreads the Urine! Any liquid based cleaning solution (including steam cleaning) doesn’t work because you will never be able to “blot” or wash all of that wet urine mess out! You still have dog urine, cat urine or human urine stains and odors because they are deep down in the fibers or pores of the surfaces! Liquid products cannot absorb and extract the dog urine, cat urine or human urine and only masks the smell for a short time. Eventually the urine stains and odors return! The ONLY way to completely clean the areas is to use a DRY POWDER cleaning process – a process that “sponges” up urine and ABSORBS it, thereby REMOVING the source of the dog urine, cat urine or human urine stains and odors… PERMANENTLY! Step 1: For removal of dog urine, cat urine or human urine stains and odors that are old & dried-in, first apply the UrineRelease Pre-Spray to loosen the dog urine, cat urine or human urine. Step 2: Apply the UrineOut Powder™ microscopic sized urine cleaning “sponges” onto the soiled area. Step 3: Simply brush the UrineOut Powder™ microscopic sized urine cleaning “sponges” into the soiled area. 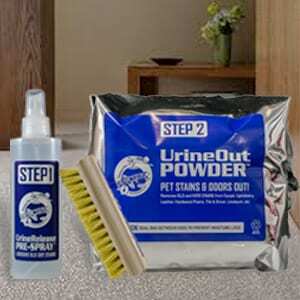 The Powder does all the work by “sponging up” and absorbing the dog urine, cat urine or human urine stains & odors. Step 4: Allow the Powder sponges to dry completely. 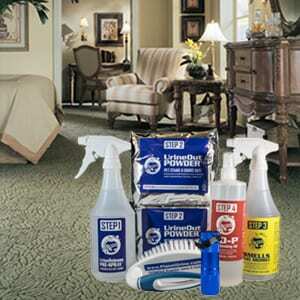 Then simply vacuum out the dog urine, cat urine or human urine stain & odor laden Powder sponges. 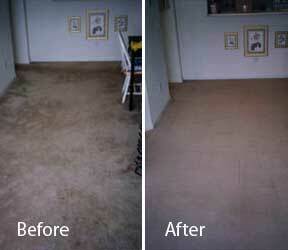 Dog urine, cat urine and human urine stains & odors are gone! Permanently! You have a right to be leery of products that claim removal of dog urine, cat urine or human urine from carpets, rugs, upholstery and more!